It can identify valid utilities as malware. Trend Micro Antivirus+ Security is one of the top antivirus products in the market today. It earns high marks based on our research for this Trend Micro Antivirus+ Security review. Of course, we can’t say the same for independent lab tests. Trend Micro Antivirus+ Security has some useful bonus features such as ransomware protection along with a firewall. And all of that is for you to try out in the latest version of Trend Micro Antivirus+ Security. They sometimes like to blur that fine line that exists between a small security suite and a standard antivirus utility. Perhaps that is the reason why we can see a plus sign in Trend Micro Antivirus+ Security. This plus sign basically refers to the fact that Trend Micro Antivirus+ Security has some bonus features. Along with others as well. These are features that you would normally find in a full-scale security suite. And that is the reason why Trend Micro Antivirus+ Security gets to earn high scores in most malware tests. Some independent labs aren’t so sure about Trend Micro Antivirus+ Security though. And hence Trend Micro Antivirus+ Security doesn’t top the list of many independent labs. Of course, that doesn’t mean Trend Micro isn’t any good. It just means that while for some it may be the best, it isn’t the undisputed best antivirus security tool in the world. That title probably belongs to Kaspersky. 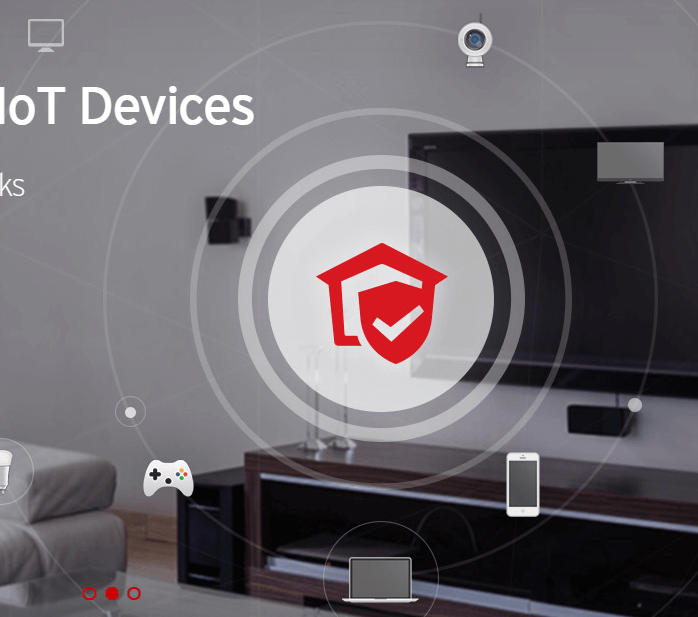 Regardless, Trend Micro Antivirus+ Security offers more than enough to earn your consideration. If you want to protect your computer, one in number, for a period of 12 months then Trend Micro Antivirus+ Security will cost you $39.95 for the whole year. While this may look cheap or expensive to you depending on where you are coming from, we can assure you that this price is the industry standard price. If you want to protect yourself with Bitdefender Antivirus Plus, then too you’ll have to shell out around $39.99 per year. That’s the same price that some of the other top antivirus products like Webroot SecureAnywhere Antivirus and others offer as well. After you subscribe to Trend Micro Antivirus+ Security you’ll have to create an online account during the installation process. Or if you already have an account then you will have to log in during the installation process. The Trend Micro online account allows you to do a lot of things. It allows you to manage your subscriptions. It even allows the user to view and read security reports remotely. 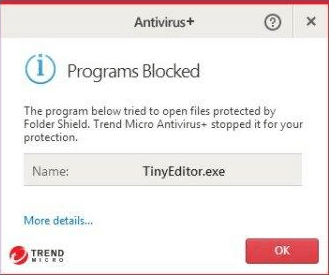 After you have installed Trend Micro Antivirus+ Security, you’ll receive a notification in the form of a prompt. This prompt will tell you to enable a feature called Folder Shield immediately. The Folder Shield feature is basically Trend Micro’s ransomware protection component. We’ll talk more about Trend Micro’s ransomware protection a bit later in this Trend Micro Antivirus+ Security review. For now, you need to know that Trend Micro will also install some browser extensions for your web browsers. As with all other antivirus products, Trend Micro has a lively main window. It has a quirky appearance and we are glad Trend Micro has not forsaken its user interface theme from the previous versions. On the main window, users can see a big round button that says Scan. This button basically dominates the whole of the squarish window. There are also some icons at the top of the screen. 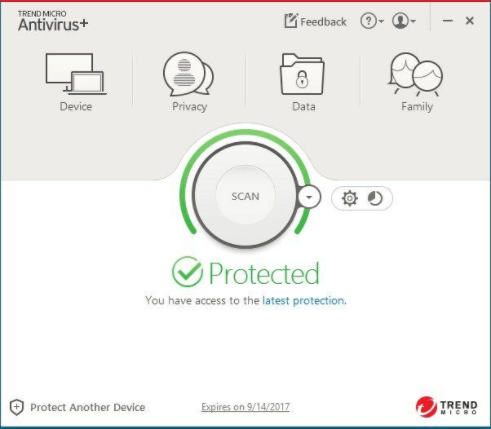 If you click the Family icon, Trend Micro Antivirus+ Security will take you to another page where you’ll get an invitation to upgrade your subscription to the security suite. Moreover, if you hover over these icons, they will bounce too. If you think it isn’t then, Trend Micro has a lot of other things in store for you. For example, you can also change the background of your main window. At least the top half. Trend Micro comes with eight predefined skins and you can select any of them as the theme for your Trend Micro. You can even use a custom photo of your own. Do you want to use a selfie? What do malware coders want? And the best way to make easy money is to distribute ransomware. Plenty of malware coders have made a lot of money by simply selling their ransom to visitors of the dark web. Probably, the best thing about ransomware as far as hackers are concerned is that the payoff is instant. When hackers use a Trojan to steal someone’s credit card information, they don’t get the money straight away. First, they have to steal the thing and then they have to sell them at a cheap price in one of the many black markets on the web. And Trend Micro Antivirus+ Security recognizes that. And hence has moved its focus from other areas to ransomware protection. Ransomware malware which is PC specific tends to focus on two things. First, these ransomware want to encrypt your files. Then they want to make you pay for those encrypted files in order to get the decryption keys. Trend Micro Antivirus+ Security Folder Shield component is designed to foil such cyber attacks. It prevents any unknown application on your machine from altering any documents that are placed in a protected folder. By default, Trend Micro Antivirus+ Security protects common folders such as DOcuments folder and all the subfolders within the Documents folder. However, there are always those users who store their important documents in places other than the Documents folder. If you are one of those users, then you should reconsider that decision. And then move all those documents to your default Documents folder. Panda security suite offers something similar but it can protect multiple folders. However, if you sign up for Panda Antivirus Pro then you won’t get that feature. Hence we should compare like with like. If you try to test the ransomware protection feature with a real-world ransomware sample, you’ll be disappointed. Because the Trend Micro Antivirus+ Security antivirus feature will wipe it out instantaneously. To test it, you’ll have to turn off the antivirus protection feature for a little while. 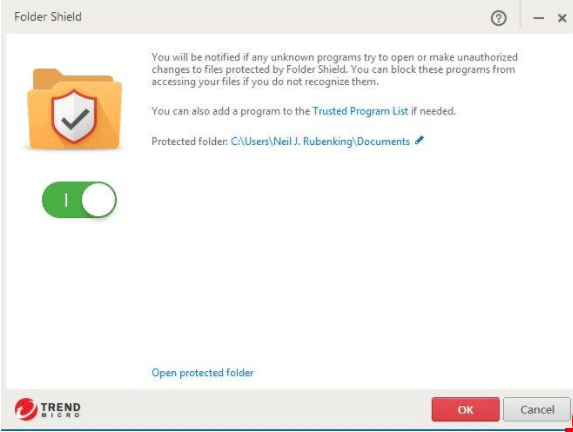 However, our research for this Trend Micro Antivirus+ Security review shows that doing so will also turn off your Folder Shield feature. If you know a lot about malware and stuff then you can always create your own basic and rather simple file-encryption tool. Then try to encrypt files that are placed in the Documents folder with that. You’ll find that you’ll fail. Because, again, Trend Micro Antivirus+ Security will block your efforts. Basically, Trend Micro Antivirus+ Security goes after every malware-like behavior and not just actual malware. If you try to write a script in a text editor and then try to use it to alter your protected files, the Folder Shield will kick into action and warn you that an unknown tried to open your protected files. In other words, Trend Micro Antivirus+ Security works to perfection. Trend Micro Antivirus+ Security is different from many other top antivirus products because it can call out specific ransomware samples. It doesn’t just give you a generic warning which says Threat Detected. If you test Trend Micro Antivirus+ Security with some ransomware-hosting websites, then it will identify each of them by name. Moreover, Trend Micro also has a special ransomware hotline. This hotline is set up in order to facilitate even non-customers. In other words, you can call this number and get help. There is also an information page. This information page has links which grant you access to some more ransomware-removal utilities. There is one simple tool which is specifically designed to destroy ransomware that locks your computer screen so you can’t use your computer machine. There is another type of ransomware-removal tools which decrypts files. As you know, the internet is seeing more and more of these file-encrypting ransomware malware, and it looks like Trend Micro has already prepared for the inevitable. As mentioned more, Trend Micro Antivirus+ Security has mixed lab results. There are many independent labs that test antivirus products. But only a few are worth following. For the purposes of this Trend Micro Antivirus+ Security review we follow, do include Trend Micro Antivirus+ Security in their testing labs. Which is obviously a good sign. Some of these independent labs do rate Trend Micro Antivirus+ Security highly. The AV-Test Institute ranks antivirus products via scores. Then AV-Test Institute ranks products via three parameters. What does the usability category stand for? It just means that an antivirus product under testing should give a low number of false positives. Moreover, the AV-Test Institute awards each antivirus product a total of six points in each category. Needless to say, the maximum number of points that an antivirus product can achieve is 18. AV-Institute awarded Trend Micro Antivirus+ Security a total of 5.5 points for protection. Trend Micro Antivirus+ Security scored a total score of 17.5. The only other antivirus product that has scored more than 17.5 is Kaspersky. It scored a perfect 18 on its test. AV-Comparatives diligent researchers perform many tests on each antivirus product. Most reviewers believe that only five of these are relevant. And we’ll discuss those shortly. If a given antivirus product manages to pass one of AV-Comparatives tests, it earns the esteemed Standard certification. However, antivirus products that go above and beyond the call of duty get to have either the Advanced or Advanced plus certification. Our research for this Trend Micro Antivirus+ Security tells us that it only participates in three of these tests. Expectedly, Trend Micro Antivirus+ Security managed to score a rating of Advanced in two of these malware-detection tests. In the third test Trend Micro Antivirus+ Security scored a Standard certification. Other top antivirus products like Kaspersky and Bitdefender scored Advanced+ in all of the five AV-Comparatives tests. Simon Edwards Labs perform real-time antivirus tests which are truly grueling. Most of the lab’s tests require a lot of time. Not to mention, they also require a lot of resources. And hence, by necessity, the lab includes very few antivirus products. Thankfully, Trend Micro Antivirus+ Security is one of those few antivirus products. We are happy to report that Trend Micro Antivirus+ Security scored an excellent AA certification from Simon Edwards Labs. Other top antivirus products like ESET NOD32 Antivirus managed to score the much coveted AAA rating. MRG-Effitas is a relatively new independent lab in the sense that reviewers have only started to count its scores in the past year or so. It has the most relevant of Trojan tests called banking Trojan tests. There are other tests as well that deal with all other types of malware. MRG-Effitas carries out its tests a bit differently than the rest of the independent labs. And because of that, the majority of the antivirus products that participate in its tests, fail the test that measures for security against all malware. Most of the antivirus products also earn a partial credit or outright fail MRG-Effitas banking Trojan tests. And since the pass rate is so low, Trend Micro Antivirus+ Security failed its MRG-Effitas baking Trojan test as well. Trend Micro Antivirus+ Security did manage to pass the comprehensive malware test and earned a rating of Level 2. MRG-Effitas tests antivirus products on a pass-fail grade and hence it is very difficult to give MRG-Effitas tests much weight. First, there are independent labs tests, which are more comprehensive and reliable, and then there are real-world tests that reviewer do on their own. To test antivirus products, one has to open selected folders that should contain some malware sample collections on the test machine with the test antivirus product installed. After that, reviewers should record the results. Our research for this Trend Micro Antivirus+ Security review, tells us that Trend Micro Antivirus+ Security can eliminate more than 65 percent of such malware samples. But it doesn’t display multiple pop-ups of those warning notifications or its discovery reports. It does show the total number of malware samples found though. And it does so, via a single big pop-up. Moreover, it also displays a link to the details of those found malware samples. What Happens With The Remaining Malware Sample? Obviously, if you want to comprehensively test an antivirus product, you have to launch those remaining malware which Trend Micro Antivirus+ Security didn’t clean out in the first try. The best way to do this is to select four or five at a single time. Process each one of them and then delete the rest. Our research for this Trend Micro Antivirus+ Security shows, that Trend Micro even caught malware samples as they were being deleted. You can always use a virtual machine to test malware samples as well. This is another way to test an antivirus product. Just copy those old surviving malware samples and then copy them to a new folder. Our research shows, Trend Micro Antivirus+ Security removed more than 25 percent of those samples as well. So, Trend Micro Antivirus+ Security removed over 65 in the first round, and then 25 percent in the second round for a total of more than 90 percent. Overall, Trend Micro Antivirus+ Security detected over 96 percent of malware samples. Hence that earns it a good 9.7 out of 100. For those who want to know, Norton scored the same as well. However, Webroot SecureAnywhere AntiVirus earned that perfect 10 on this test. An antivirus product that wipes out malware from the user’s machine is without question good. But the better antivirus products in the market do something else which is better. They keep malware sample from ever landing on the user’s machine. That’s the mark of a great antivirus product. How do you test for this capability? Users can accidentally download malware via tons of websites that offer downloadable files. MRG-Effitas provides a list of malware-hosting URLs which is regularly updated. You have to test your test machine with the test antivirus product installed on it with these malware-hosting URLs. You have to launch each URL. And then record if Trend Micro Antivirus+ Security does anything about it. It has to block it, otherwise it fails the test. Moreover, a good antivirus product will not only block malicious URLs but it will also eliminate the downloaded malware. Bad antivirus products just sit there and do nothing. For completeness’ sake, each antivirus product should be tested with at least 100 malicious and dangerous URLs. Our research shows that Trend Micro Antivirus+ Security can block around 90 percent of all malware downloads. And it does so by blocking the malicious URL and showing the user with a “dangerous” message page within the web browser. The dangerous page is like a big warning page. 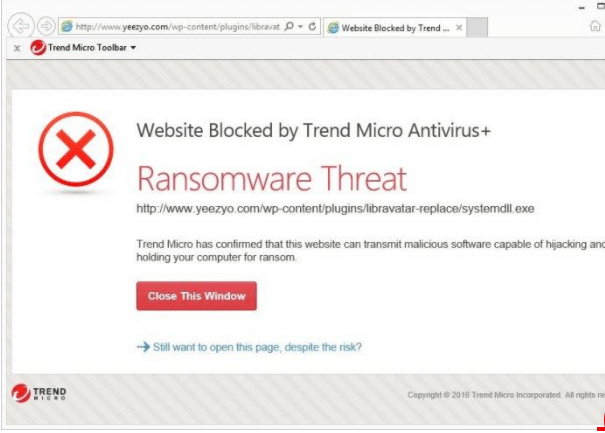 In a few cases, Trend Micro Antivirus+ Security even warned that the identified site had ransomware hosted on it somewhere. The average score for other antivirus products in the industry is around 70 percent. For example, the best antivirus product in this category is Avira. It can block up to 99 percent of all malicious URLs and downloads. Norton is also pretty good. It blocks 98 percent of all malicious URLs. To do that, you can easily install some known PC utilities and check if Trend Micro Antivirus+ Security reacts with a warning. If you try to place a utility that can create a database in your Documents folder, then Trend Micro Antivirus+ Security will correctly warn you about it. That’s what its Folder Shield is for. Apart from that, we found, that Trend Micro Antivirus+ Security rightly stayed quiet. In one case though, Trend Micro Antivirus+ Security’s heuristic analysis somehow identified one legitimate utility as a genuine malware. In the end, it deleted it. Because independent labs results have already shown that Trend Micro Antivirus+ Security isn’t the best when it comes to not having any false-positives. You can check back the AV-Comparatives test section for more details. Malware hosting URLs are insidious. But phishing URLs are worse. Because most of the time these phishing websites masquerade as legitimate sites. Basically, the hackers behind such phishing sites want to trick you. They want to fool you into giving up your sensitive information. Once they have you login credentials, you are burned. Fraudsters behind these sites, can wipe your bank account clean off the face of the earth. They can also steal that Paladin level 110 that you worked so hard to get. What’s more, after these fraudsters have made their way and scammed a few online users, they shut down the phishing site. And then get to work on another phishing website. So, you can bet that testing antivirus products for anti phishing features is hard. Because the phishing site is not there anymore. So to test antivirus products for phishing protection, you need to test an antivirus product with reported phishing URLs. But you need to have a list of phishing URLs which are not blacklisted. Because by the time someone blacklists these phishing URLs, fraudsters have already taken it down. So, you need phishing URLs which are unanalyzed and un-blacklisted. After that, the best way to test an antivirus product is to use five browsers. The antivirus product under testing should protect only one of these five browsers. Then, one must make sure that Symantec Norton Antivirus Basic protects another browser. Symantec Norton Antivirus, as we know, is the leader when it comes to anti phishing effectiveness. Leave the rest of the three browsers (Internet Explorer, Firefox, and Chrome) on their own. By that, we mean that each of the remaining three browsers should just rely on their built-in protection. That gives us a nice setup to measure how effective Trend Micro Antivirus+ Security is against phishing sites. The problem with this phishing URL setup is that every time you do the test, you have a different set of URLs. So, the reported results aren’t really raw detection rates. This phishing URL setup will give us the difference between Norton’s detection rate, the browsers’ detection rate, and the antivirus-product-under-testing’s detection rate. We are happy to inform you that Trend Micro Antivirus+ Security performed well. In other words, it lagged Norton by only two percentage points. And it beat all the three browsers with no additional protection. Trend Micro Antivirus+ Security can count itself amongst the elite antivirus products when it comes to protection against phishing sites. A lot of people online today use Facebook as their main source of news. Some use other social media sites as well. Facebook can suggest its users news links. Your friends can post some links as well. And all you do is click. Of course, some more click. But who is to say that some of those links aren’t bogus? What if a hacker hacked your friend’s Facebook account and then sent all its FRIENDS, you, bogus links? And if you are clueless enough, you might unknowingly share a malicious website with your friends as well. Trend Micro Antivirus+ Security is here to save the day. 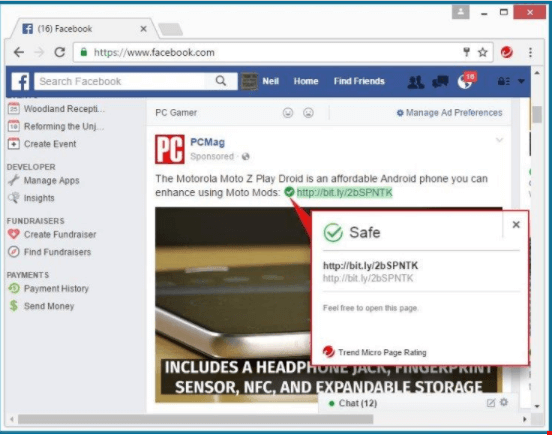 Trend Micro Antivirus+ Security, by default, has a feature which automatically highlights social media links. Green for a website that is safe. Yellow for a website or link that is iffy. And the traditional red for a link that is dangerous. There is a Grey too for links which are considered as untested. Don’t click a link if it is not green. Trend Micro Antivirus+ Security also shows a small icon on each link. If you click the small icon, you can see a popup. This popup will explain the given rating. But Trend Micro Antivirus+ Security does not have a link in that popup which takes you to a detailed report page. Norton marking feature does allow you to click the popup and then it takes you to a detailed report page. The browser extension is great because it rates all the links that appear in popular search engines. Users have the option of enabling the browser extension to rate links not only on the search engine results page but also on any links that come up on a given web page. Enabling that option will allow you to view more information about any link that you hover over. Trend Micro Antivirus+ Security doesn’t really have a firewall component. None of its security suites do. But it does give you something else. It gives you a component called Firewall Booster. This Firewall Booster feature ships with most of its premium suites and antivirus products. Our research for this Trend Micro Antivirus+ Security review shows that it is slightly difficult to observe firewall booster feature in action. But on PCMAG reporter got some Trend Micro people to do a bit of talking. They supplied a specific file that Trend Micro’s firewall booster detected as something called Nimda worm. Note, it may have a “worm” endname but it is actually innocuous. The PCMAG reporter then used some network tools in order to send some files to the test system at hand. 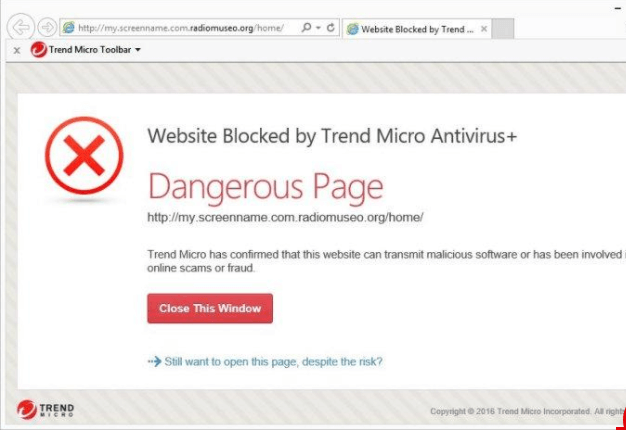 And as expected, Trend Micro Antivirus+ Security sent the user a “Network Threats Blocked” message in the form of a pop-up. In order to further gauge a response from Trend Micro’s Firewall Booster, one could also use some other exploit tests. Other antivirus products like Norton have the Intrusion Prevention System. The Intrusion Prevention system can block around 66 percent of these exploits at the network level. And it can even identify them by name. We are living in the 21st century now. And that means, we have email service providers that offer spam filters by default. And that’s what most consumers use today. In fact, these spam filters have become ubiquitous to the point that some antivirus product vendors are seriously thinking about dropping their anti spam filters from all security suites. Trend Micro Antivirus+ Security isn’t one of those antivirus product vendors. It still includes the spam filter as a standard feature of its standalone antivirus product. Trend Micro Antivirus+ Security’s spam filter is special. It is special in the sense that it can integrate with Microsoft Outlook along with Windows Live Mail and Windows Mail. Trend Micro will install a toolbar and from there you can configure how this component works. The bad part about this feature is that you can’t really use it with any other email client. 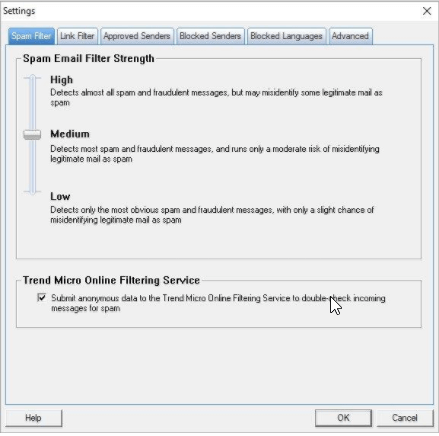 Trend Micro’s spam filter feature can filter Exchange email and POP3. It doesn’t work with IMAP. The spam filter will offer you to import your contact list right into its own whitelist after you install it. But it will only do so the first time you enable the spam filter and then launch your preferred email client from the supported list above. This way, it can ensure that none of your messages get the “block” treatment. As mentioned before, by default the Trend Micro will whitelist all addresses that you regularly send emails to. But if you want to then there is an option for manually importing contacts into your new whitelist as well. You can do this at a later date as well. The spam filter has a main page. And you can use this main page to access the spam filter’s settings dialog. There you can also see a huge vertical slider which can adjust its sensitivity when it comes to spam filtering. If you are not an experienced user at this then you should leave the slider as it is. However, if you feel like it then there is another option to enable a feature called Link Filter. This will discard messages that contain dangerous links. There is also a tab for Blocked Languages. Here users have the option to set the spam filter to get rid of any messages that aren’t in the language that you understand or speak. Trend Micro Antivirus+ Security isn’t the best when it comes to earning highest marks from all independent labs. But it is good based on our research for this Trend Micro Antivirus+ Security review. Webroot SecureAnywhere Antivirus probably has a better ransomware protection feature, but Trend Micro’s isn’t bad either. Webroot’s claims that its ransomware protection feature can actually reverse the effects of an encrypting ransomware after it has infected a machine. So of course, Trend Micro’s doesn’t match that. If you worry about ransomware all the time and if you want a dedicated spam filter for your email, then Trend Micro Antivirus+ Security is the right choice for you as your antivirus protection. 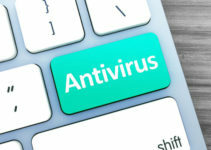 There are other good antivirus products as well, as mentioned throughout this review. You have Webroot SecureAnywhere antivirus which claims to handle ransomware as no other. Moreover, it is also very light. Then you have the Symantec Norton Antivirus Basic which has made a strong comeback after a long hiatus. It is also very dependable. Then, there is McAfee Antivirus Plus which is a bit more expensive but can protect all of the user’s devices no matter the number. Kaspersky AntiVirus and Bitdefender Antivirus Plus which earn the highest marks from all independent labs all over the world.